For over 80 years, the Hotel San Carlos has been a downtown host for intimate meetings, conferences and receptions. Our historic décor offers perfect ambiance for any event, and we welcome you to use your choice of catering professionals, or we can refer you to one. 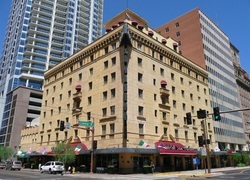 Affordable elegance awaits you at the historical Hotel San Carlos, a "Downtown Diamond" since 1928. In addition to beautiful and unique surroundings, our conference staff will give you the one-on-one attention you deserve, and ensure the success of your next reunion.